Madison Square Garden has become my favourite venue because it lies midway between my office and home, allowing me to occasionally stop by on my evening commute. Even better, the StubHub office is just a few blocks away, which means that I can pop in there and perhaps find a bargain for the game that evening. Years ago, I criticized StubHub and other resellers for being overpriced, but that is no longer the case. Still, Rangers tickets rarely fall into my acceptable price range (and I'm not even bothering with the Knicks this season), but on occasion there is another event that catches my attention but not that of other sports fans. Such was the case on Thursday when the 2K Classic was held, featuring two top-25 teams in Texas and Syracuse as well as Iowa and Cal. 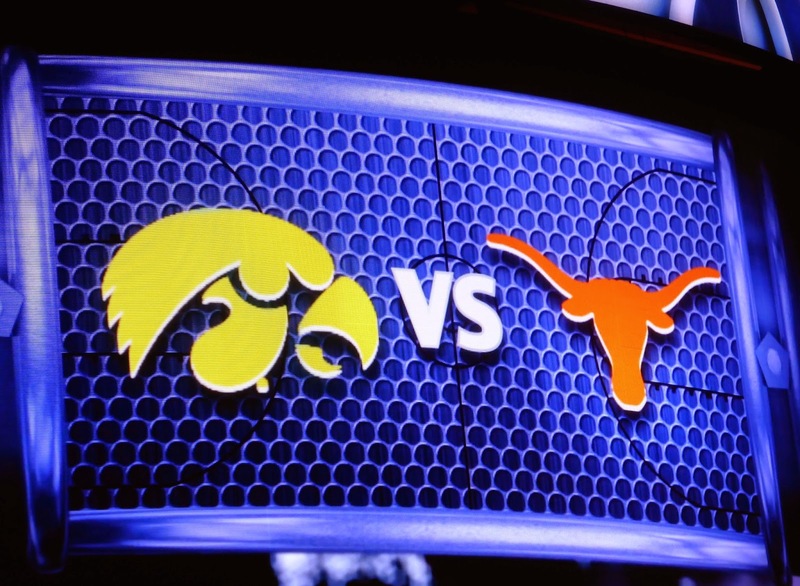 Tip off for the first matchup featuring the Longhorns and Hawkeyes was scheduled for 7, and at 6:30, tickets were down to $4 on StubHub. Yes, four dollars for two games. New Yorkers don't seem interested in college hoops when a local team is not playing, all the better for me. Despite the nearly free prices, I decided upon a ticket in the Club Platinum area for $27 (face was a ridiculous $170) as it would be the only chance I would ever have to sit in this area. I was able to enter via the special club entrance, a once-in-a-lifetime experience that saved me about ten seconds. Again, crowds were not fighting to get in here. 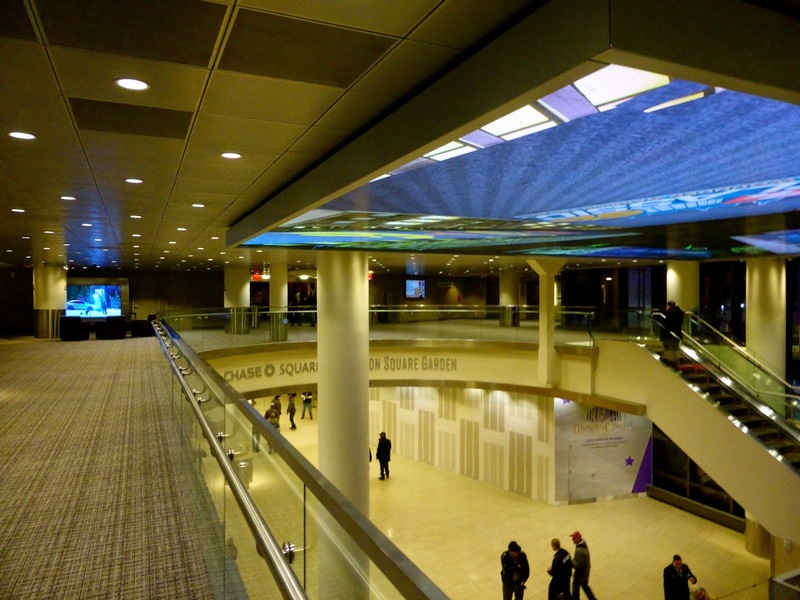 The above shot is from the special club area above the main lobby. You might ask why this is the best I could do. Turns out the "Club" in Club Platinum is pretty meaningless, I took another escalator up and wound up on the lower concourse with the rest of the hoi-polloi. Well, at least my seat was pretty good. Texas came in ranked 10th in the nation but were flat in the first half, allowing a poor-shooting Iowa team to take a 27-15 lead late in the period. Aaron White (with the ball above, running past Myles Turner, the #2 high school prospect this past off-season) was the top scorer with 11, but Turner turned the tide with this three-pointer and the half ended with the Longhorns down 30-24. That was as close as Iowa would get. Well, not really, but they were out of it just three minutes into the second half as Texas senior Jonathan Holmes potted 11 points as the Longhorns outscored the Hawkeyes 18-7 before the first media timeout. 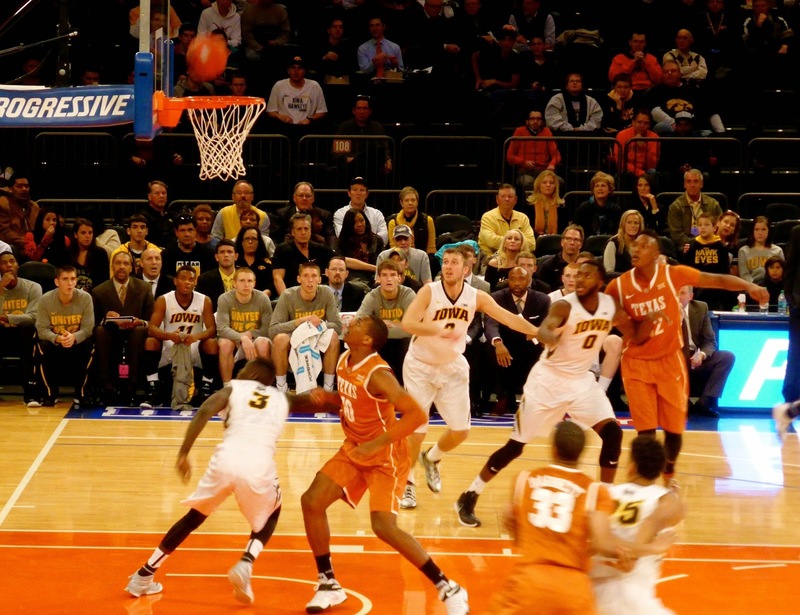 Iowa never really threatened again as Texas ran away with the game 71-57. The big news was an injury to Isaiah Taylor, Texas' sophomore guard who was taken out by a flagrant foul on a drive in the lane late in the game. As a scout near me said "10 points up, 2 minutes to go, no reason to do that." In other words, Taylor was trying to showoff on national TV. He is out 4-6 weeks, so he should be back in time for conference play. 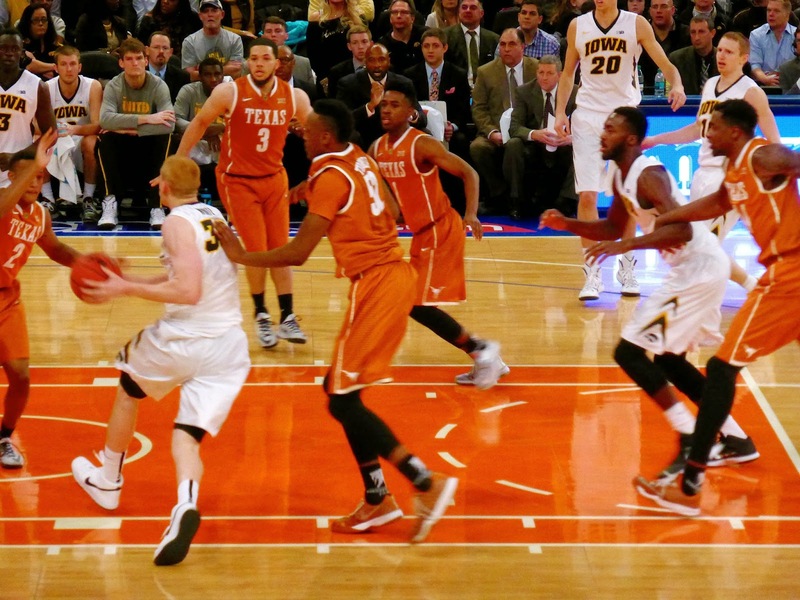 The second game featured #23 Syracuse against Cal, another orange vs white battle. I don't have any true allegiance in college basketball, but growing up in Ottawa, Syracuse was the nearest big school and so I was kind of pulling for them. It was certainly cool to see Jim Boeheim (above) in the flesh for the first time. 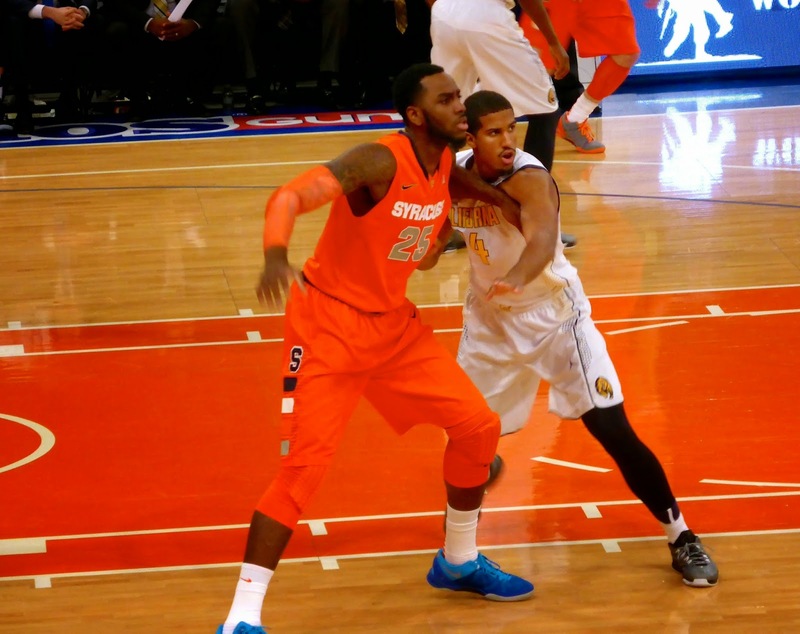 The Orange were led by Rakeem Christmas (#25 naturally, below), who completed his degree in 3 years. Yes, some are students before athletes. The game was close through the first half, tied at 17 with five minutes left. Unfortunately, my lifelong jinx continues as Cal ended the half on a 17-5 run that pretty much ended the game. At his point, I decided to leave. College basketball is a great game but having media timeouts every four minutes just kills the flow and makes the games last so much longer. Despite a 7:00 pm scheduled tip for the first game, it was well past 10:30 when the first half of the second contest ended. Still not sure how those who work can stay up so late for these games. I got home around 11:15 and saw the last few minutes on ESPN2 as Cal held on for a 73-59 upset. Both games ended with 14 point differentials. Texas beat Cal 71-55 on Friday to win the 2K Classic "title".